There are not as many variants of Blackjack available to play at mobile casino sites when you compare them to online casinos. One thing that has been put into place by the major software and casino game designers however, is that they have made their lowest house edge Blackjack games available to mobile casino players. As anyone who plays Blackjack will tell you, it is always the game play rules and the payouts awarded on any Blackjack game which are going to determine whether that game is one you should play or one you should avoid! By giving everyone access to casinos via their mobile phone or tablet device and thus the best Blackjack variants they offer, you will have the opportunity to play at sites running Playtech’s or Microgaming’s mobile gaming platforms and you will get the best winning opportunities and the best Blackjack games on offer. There are currently two different Blackjack variants offered at our showcased and featured Microgaming mobile casino sites, those of course being Jackpot City Casino, the Gaming Club Mobile Casino and the ever popular Vegas Paradise Mobile Casino site. The first Blackjack game they offer is the Classic variant. This particular game should always be the first and only one you consider playing. This is because, due to the game play rules, when you play this game with perfect strategy, it boasts the lowest house edge of any mobile Blackjack game. Our three featured Microgaming mobile casino sites also have a brand new variant that has just been released onto the mobile gaming platform. This game is the easy to play European Blackjack game, which has been available at Microgaming powered online casino sites for many years now. Both of the Blackjack games you can play at those above listed mobile casino sites, offer the standard payouts when you win. This includes 3 to 2 for a winning Blackjack hand, 2 to 1 for a winning Insurance wager and all other winning hands get paid out at even money. You will of course be able to choose the stake levels at which you play either of the two currently available mobile Blackjack games because all of the chip values can be adjusted quickly and easily by players. As you might know,, we have full reviews of some of the best Playtech software powered casinos. These are accessible via a mobile phone, these sites are the fully licensed and regulated Bet365 Mobile Casino, Winner Mobile Casino and the great sounding Casino Las Vegas Mobile Casino. All three of these mobile casino sites by unitizing Playtech software are going to give you a very wide and diverse range of casino slot games, card and table and video poker games plus plenty of more unique types of casino and arcade games. However, if it is the instant playing of a game of mobile Blackjack on your mobile device you are looking for, you will not be left wanting more since these excellent variants of this card game are all three of these listed sites have on offer. Playtech has chosen to install a Standard Blackjack game as the variant on offer at all mobile casino sites utilizing their software and mobile gaming platform. As such a low house edge game can be easily accessed and it comes with plenty of stake level options for players to choose from. The game plays particularly well on touch screen devices, as you can quickly and easily both place your wagers onto the mobile Blackjack tables whilst just as easily be able to control all aspects of the way the game plays; such as doubling down your wagers, hitting and standing a hand etc. 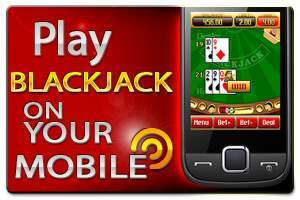 However, if you are not currently the proud owner of a touch screen mobile phone or tablet device, fear not as you can still play this Blackjack game on standard mobile phones which have the Java application installed. The vast majority of phones now have this, so this will not prove to be any trouble at all! Just like when you are playing Blackjack in a real life environment, you need to ensure that you are playing perfect strategy for the Blackjack variant you are playing on your mobile device. Make sure you learn how to play that particular variant perfectly. The one wager that you should never place, when playing any type of Blackjack game, either on a mobile phone or anywhere else for that matter, is of course the Insurance wager. This Insurance wager really is a poor valued bet and this is due, in no small part, to the massive house edge that is attached and associated with that one side wager. So if you are offered the Insurance wager option while playing, which you will be, always turn this down!